The Regina is a scaled down messenger bag made from layers of sturdy duck cloth double stitched with raw edges to give it that deconstructed look. Can be worn over one shoulder or across the body. 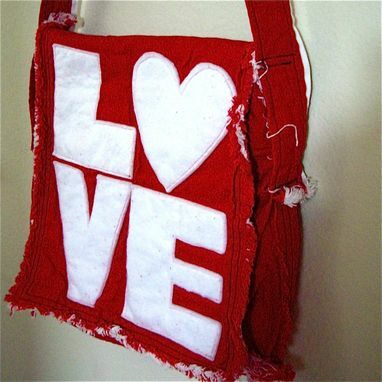 This Regina is embellished with a machine sewn, double layered felt letters that spell L-O-V-E. Messenger is machine washable. The lining is a coordinating cotton fabric. This bag has 2 pockets on each side.